Today, in the fourth installment of “Engines You Should Know,” I’m breaking out some heavy weaponry to convince you once and for all that inline-sixes are simply the best engines of all. If somehow the modern all-aluminum 4200 Vortec Atlas engine from General Motors didn’t convince you, I guess I can understand. If the supremely mod-able 2JZ-GTE in the Toyota Supra still didn’t have you nodding your head, then perhaps you need to see a doctor. And if after those two, the bulletproof Ford 300 inline-six wasn’t enough for you to see the light, well, I have the antidote to your ailment: the legendary Cummins 12-valve, the engine that served as the backbone of the now-bustling diesel performance community. A lot of the reason that engine is as durable as it is is because we designed it to be a heavy duty, commercial kind of engine. He went on to say that the 5.9-liter engine actually originally started as a joint venture between the Indiana-based diesel engine company and Case Corporation, which builds tractors and construction equipment. And indeed, starting in 1984 (well before the 5.9-liter engine ever found itself powering a Dodge Ram), Cummins offered three different variants of the 5.9-liter called the 6B, 6BT (turbocharged) and 6BTA (turbocharged, aftercooled), which served duty in tractors, combines, excavators, road graders, pavement rollers, boats, field sprayers and even school buses. These are all seriously heavy duty applications. Add that to the fact that these engines were available in dozens of different markets with different climates and work environments (like Russia, China and India), and you can imagine how relatively understressed that Cummins Turbodiesel was once it finally made its way into a Ram pickup in 1989. When Dodge put the Cummins Turbodiesel into its Ram in 1989, a legend was born. GM and Ford couldn’t compete with their relatively gutless diesel offerings; the Cummins blew them out of the water. Even though the Cummins 12-valve only cranked out 160 horsepower, with its long-stroke and undersquare design (4.02-inch bore, 4.72-inch stroke), the engine made 400 lb-ft of pavement-destroying grunt. Chevy’s 6.2-liter and Ford’s 7.3, by comparison, weren’t even making 250 and 350 lb-ft, respectively. But perhaps even more impressive than its factory torque numbers is the engine’s reputation for longevity. Once you start looking at the mechanical bits, you begin to see just how overbuilt the B-Series engine really is. The block and head are cast iron, the crankshaft and connecting rods are forged, the seven main bearings are massive, and like many heavy-duty diesel trucks, the crank and cam are connected by a steel timing gear—not a chain or belt like you’d find in normal cars and trucks. The Holset turbos are also know to last until the end of time. There’s really not a lot going on with this engine; simplicity, really, is what makes the silky-smooth inline six unkillable. The cam is in the block, actuating pushrods to open and close two valves per cylinder, the geroter-style oil pump is right up front on the accessory drive, there’s no aftertreatment system (just a muffler), and the fuel injection system is purely mechanical. I talked with Tyler from Diesel Power Products, a Washington-based Diesel performance parts supplier, and he told me the basic formula for why the Cummins 12-valve is such a beast, saying it’s just “too dumb to die.” And that mechanical fuel injection system, he says, is the key to what truly makes the 12-valve “dumb” (but in a good way). Unlike the later 24-valve ISB model that came around in mid-1998—which used a Bosch VP44 electronic rotary style pump—the 12-valve offered between 1989 and 1998 used a fully mechanical fuel injection system that used the cam to time when fuel was injected into the cylinders. This, Tyler told me, made the engine “The most reliable, simplest, as basic-as-it gets, fully-mechanical diesel engine” a diesel tuner could ever ask for; in fact, the vehicle literally only needed a couple wires to turn the motor over with a starter; and once it was running, the engine needed no electronics at all. Compare that to the bag of snakes all modern engines have under hood, and you realize just how simple this motor is. Perhaps even more interesting than reliability and simplicity, Tyler says, is that the fully mechanical fuel system gave the end user “complete control” of how the engine generates its power. Early diesel Rams (’89 to ’91) came with a mechanical VE rotary fuel injection pump that really wasn’t so great for tuning. But from 1994 to 1998, Cummins threw on the Bosch Bosch P7100 mechanical injection pump, also known as the “P-Pump”—a part that changed the diesel tuning world forever. The P-Pump, as Tyler puts it, is “basically a little engine in itself.” Driven by the engine’s cam gear, the P-Pump is an injection pump that gets fed fuel from the lift pump (which takes fuel from the tank). The injection pump’s six plungers—which ride on a camshaft in the pump housing—move up and down in barrels. That upward movement pressurizes the fuel and pushes it through the delivery valve, which meters the fuel and sends it into the engine’s cylinders through an injector. The way the P-Pump is set up allows for lots of easy modifications. Among those mods are fuel plates with different “cuts” to reduce the restriction of fuel flow at high engine speeds. Between installing a new fuel plate (or just hacking up the old one with a grinder), replacing the governor spring with a stiffer one (usually owners go with a 3k to 4k spring) for better throttle response, and tuning the preboost screw (for better low rpm fueling) and starwheel (for improved throttle response), basic adjustments to the P-Pump can add 150 horsepower to a Cummins 5.9. This, of course, assumes that the injectors, lift pump and turbo have been adjusted accordingly. There’s even more Cummins 12-valve owners can do to add power besides fiddling with the P-Pump. With a different intake and exhaust, bigger turbos, a better lift pump, bigger injectors, perhaps a beefier crankshaft damper, new valve springs and pushrods, some basic head tweaks, and maybe a girdle at the base of the block to prevent crank wrap, many of the stock internals can handle 1,000 horsepower without issue. While Ford and GM have swapped out their diesels a number of times since 1989, architecturally, the Dodge’s Cummins has remained fairly similar to the original. Still, the Cummins 5.9 saw a number of little throughout the years. A few years after its introduction in mid 1991, the engine added an intercooler. Then in 1994, the motor changed from a rotary Bosch VE rotary pump to the P-Pump. The 12-valve went away in 1998, replaced by a 24 valve which offered better breathing. At the same time they made the swap to 24 valves, Cummins put in Bosch VP44 electronic fuel injection; though the injection pump was still driven by the cam, the timing of fuel injection was no longer mechanical, instead driven by a solenoid. 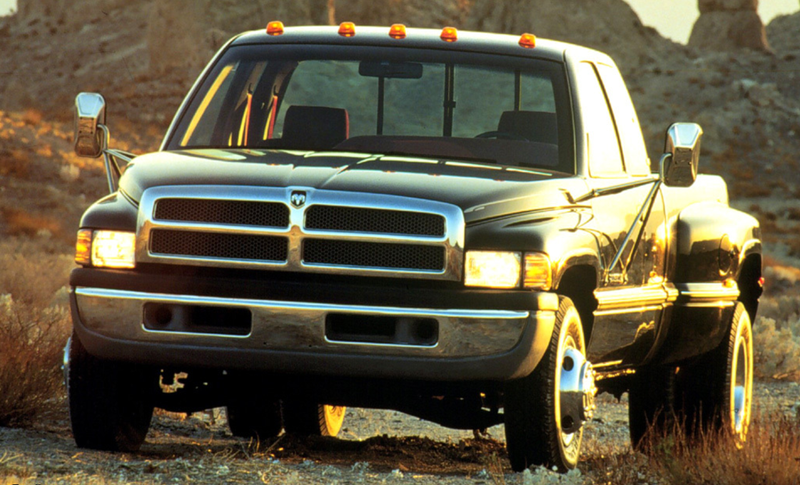 In 2003, the Ram’s 5.9-liter switched to a Bosch common rail system. The big change happened in 2007. For the beginning part of the model year, the 5.9-liter stuck around. But starting in January of 2007, the 5.9 was finally replaced by a bored and stroked version with 6.7-liters of displacement. The change brought a fairly complex after treatment system with it to meet emissions, which warranted the increase in displacement to maintain performance. Many diehards decry the complex emissions components and the electronic fuel injection system, as they both do a number on tune-ability. Regardless, the 6.7-liter Cummins, and frankly any truck with a big chrome “C” on the fender, gets tons of respect from diehard diesel enthusiasts around the world. It wasn’t perfect, as many 12-valves were plagued with the “Killer Dowel Pin,” (seen in the picture above) which could back out and get squeezed between the cam gear and the gear cover, ultimately destroying the engine. But that’s a fairly straightfoward fix, and if you look at the nearly 10,000 people who are part of the Cummins High Mileage Club, and the dozens of 5.9-liter owners who have crested 1 million miles, you realize why this motor is regarded by many as the very best diesel engine ever put into a pickup.